The day my Muy Bueno Cookbook came in the mail , I got a cup of tea and headed to the porch knowing I wouldn't put the book down until I had read it cover to cover. The first thing I noticed was the size of the book, it is just perfect for my book shelf and yet not to big for my hands. As my fingers began to scan the recipes and the beautiful photos the pages were smooth and pleasant to touch. 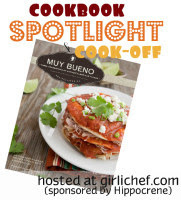 Muy Bueno is a beautiful Cookbook and I am honored to participate in the Cook Book Spotlight Cook Off hosted by Heather at Girlichef and sponsored by Hippocrene Books. Muy Bueno is inspired by Jesusita a Mother and Grandmother who came with her family from Northern Mexico to El Paso, Texas. The story of Jesusita and her warm spirit and great food are told by her daughter Evangelina Soza, and third generation granddaughters Veronica Gonzalez Smith and Yvette Marquez Sharpnack. Evangelina said "My Mother always had something delicious cooking on the stove or in the oven, and her welcoming words still ring in my ears. "Sientate a comer,esta muuuuy bueno" The wonderful recipes are brought to life by Jeanine Thurston whose photography is outstanding. As I moved through the book, I was flooded with memories when my family would visit extended family in El Paso and the sounds and smells of the kitchen with all the wonderful laughter and food were just like yesterday. Very much like my family, not only did Jesusita pass down her fabulous recipes, she passed on a certain warmth in spirit that can only be experienced with love of family and food that is so much a part of a families culture. Over the past three weeks I have made 3 fabulous recipes from Muy Bueno that I have been so happy to share with all of you. I did not have to adjust any ingredients and the cooking times were perfect, the recipes were easy to read and follow. I will be cooking from this cookbook for a very long time, it is a beautiful cookbook and Muuuuuy Bueno! I want to thank Heather at Girlichef and Hippocrene Books for inviting me to participate in the Cookbook Spotlight CookOff and my thanks to all of you for stopping by to enjoy this awesome cookbook and great food. This is a must have cookbook to add to your collection! Miz Helen, I would love to have this cookbook because it would feed my cookbook addiction - And, since it's a "must have cookbook", I need to add it to my collection. ;) Great giveaway! I would love to win the cookbook, because I am close to licking the monitor, and that is plain nasty. That Mexican Bread pudding is being pinned, and will be made...yummy! ..we love the spanish/mexican flavors in recipes...I just made mexican lasagne at http://loblollylane.blogspot.com/2012/10/no-boil-and-bubble.html ...it is so dawg-gone good!! I'm also working on my recipe for the Texas Chili cook off.....I'm having so much fun!!! Thanks for all you do Miz Helen...this is a great/fun giveaway! I would love to win the cookbook, there a number of recipes I'd love to try, especially the salsa. Miz Helen, Muy Bueno is a cookbook I would enjoy using because it sounds like a wonderful family cookbook with authentic recipes. The photos of the recipes you made look awesome! Wish I was there sitting on the porch with you looking at these gorgeous recipes! I would love to win this cookbook because I really need to start cooking more and my whole family loves food like this! I would love this cookbook, Miz Helen, because I read cookbooks as if they're novels. I like to read the ingredients and just imagine what they taste like and then I write out my list. The ones that you've made sure whet my appetite!! Thanks for the opportunity to win. Can't you just feel the love that went into this cookbook - unfortunately my family hasn't/didn't pass down favorite recipes...how sad. It would be an honor to have this book on my shelf...then I would imagine I was an extended family member of theirs cooking my relative's recipes. I could eat Mexican food daily and never tire of it! I collect cookbooks too so a double win! :) Thanks so much for the opportunity to win...I have everything crossed. Great review. I have really enjoyed this spotlight and reading your posts. Hi Miz Helen, I would love this cookbook because I especially love cookbooks written from the heart like this one sounds. Also I love authentic recipes, and I love Mexican food! Thanks so much for the giveaway! My husband and I got married in Mexico so it holds a very special place in our hearts. We also cook at least one "Mexican" meal every two weeks and I know this book would be well used! Wow! You can't live in California and not like Mexican food! Mr. T and I prepare it regularly...I would love to add another resource to the cookbook library!! I would love this cookbook, the salsa recipes especially but everything I've seen so far looks delicious. I love that these are family recipes. I am a cookbook addict, I've been following the chicas at muy bueno for a while anticipating the arrival day! It would be so much better to win one! I'd love to win this cookbook, because I'd like to expand my repertoire of Mexican dishes.